This is an adaptation of my mother-in-law’s recipe, which, being the first banana bread I ever tasted, has shaped the way I think banana bread should taste. My then-boyfriend-now-husband would get care packages our freshman year in college, half-loaves of banana bread wrapped in tinfoil, ready to be slathered with butter. In retrospect, her recipe has way too much sugar, so I cut it in half. I also added another banana, a wee bit of salt and my go-to solution in making desserts healthier: whole wheat pastry flour. It’s not that it’s terribly good for your either, but it’s glycemic index value is somewhat lower, and more importantly, it has much more nutrients than white flour. Because it’s a pastry flour, it won’t weigh down your cake the way an ordinary whole grain would. Mix the dry ingredients (in the larger bowl; in the mixer bowl if using a stand mixer), in a separate bowl, mix the wet ingredients by adding first the oil, beating the eggs in one at the time, then adding the buttermilk, mashed bananas and vanilla. Add the wet ingredients to the dry, mix well. Simple and tasty; but let’s talk about the butter. This is a Swedish recipe, and in Sweden, the default butter is lightly salted, not unsalted. So either use 1/2 salted and 1/2 unsalted, or unsalted with a dash (2 shakes from shaker, I’d say) or table salt. Makes about 2 sheets’ worth. Cream the sugar, vanilla and butter. Add the flour bit by bit until crumbly, then use your hands to press into a big ball. Form small balls, about the diameter of a quarter, and place on cookie sheet, at least an inch apart. Flatten the balls, then make an indent with your thumb, or better, knuckle, in each. 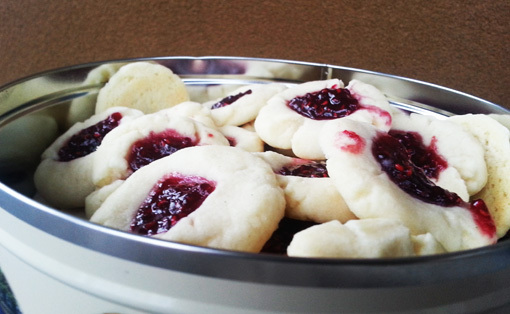 Using a small spoon, drop jam onto each cookie. Bake at 350 F for 8-13 minutes depending on oven; the cookies shouldn’t brown. Undercooked cookies isn’t a disaster, they’re just a little crumblier and the jam isn’t firm. Helpful hint: if you’re using less runny jam, remove the cookies from the oven after about half the baking time, poke the jam with a toothpick so that it forms a uniform pool, then put the cookies back and finish baking. Better get it out of the way: his bread is super easy, but it takes a long time to make. There’s a minimum 6 hour paus in between steps 4 and 5. But it is SO good. It’s a yeast bread, but gets a stronger, sourdoughesque taste profile from the long rest (and the additions of rye and flax.) 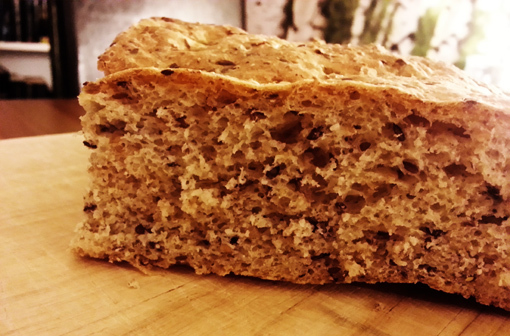 My mom would make this bread when I was little – maybe once or twice a year. 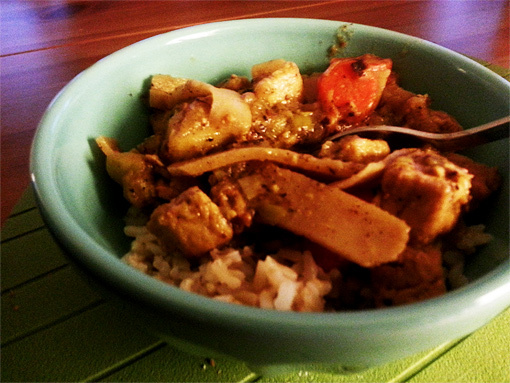 It was a big, unwieldy, recipe, so I have halved it (and I now make it once a week.) Partially because I had trouble getting it to stay tall in the full version, partially because it’s a heavy dough and my kitchenaid couldn’t knead it properly in its full size. 1. Mix the four first grains in a bowl. 2. Pour over the boiling water. 3. Cover and with a towel and let sit until around body temperature. 5. Mix in the water and cottage cheese (use small-curd and as high-fat as you can find; remember that this is the only fat in the bread, and it will be dry without it), add the salt along with the flour, which should be kneaded in bit by bit (about half a cup at a time) until the dough doesn’t stick very much to the bowl. If you are planning on letting it rest longer (1 hour+ per pause), make it slightly stickier than you would otherwise. 6. Rest in bowl for minimum 30 minutes, anywhere up to 2 hours. 7. Put into parchment-covered baking pan with tall edges, about 9×12 inches (-ish; slight variation is fine) , flatten out so that it’s even and filling the whole bottom of the pan. Prick with a fork a few times. 8. Rest for 30-40 minutes. 9. Bake for 20-30 minutes in the middle of a 435° oven, checking so that it doesn’t burn (our oven is slow and weak, it takes me 32 minutes, in our old oven it took 25, so…) Let cool. 10. Cut into two loaves, freeze if you won’t eat in the next day or two as it dried quickly. Store in a plastic bag. Enjoy with butter and cheese, or half meatballs or lunch meats of whatever the hell you want. It’s delicious. In its original form, this recipe harkens back to my grandmother and the sixties, a time period when “exotic”, foreign recipes started making them way into Swedish cuisine. It’s not necessarily… authentic to any specific country or region (and also contain entirely non-asian items), and mixes things no sane person should mix, but I kind of love it. Possibly because I grew up with it. Originally made with pork; if for some reason you are a carnivore and want to use that, skip the soy sauce. Vegetarian. Can me made ovo-vegatarian by not using cream, or replacing with coconut cream or cashew cream. Total cooking time: around an hour for one person in tiny kitchen. Can be cut down to about 35-40 minutes if there’s two of you, you’re multitasking, and have a decent-sized kitchen. In a large thick-bottomed pot, heat some oil and add about 1 tbsp of curry. 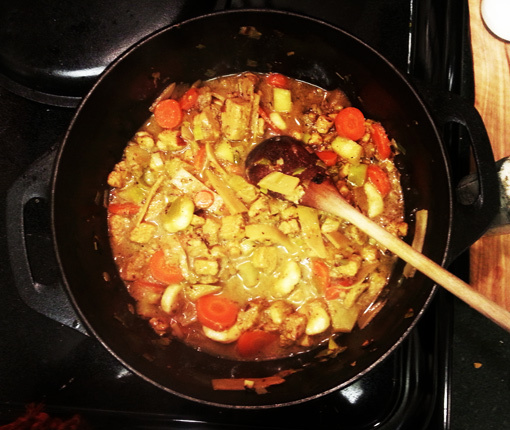 Brown the (thawed) quorn pieces in the oil/spice. I find that olive is a bit too flavourful and not quite matching the rest of the dish, so I use canola. You can mix in some sesame too, if you have, but beware that you’ll use quite a bit of oil (there’s no natural fat in any of the other ingredients.) Drip in a bit of soy sauce, being careful not to overdo it; the broth will make it plenty salty. 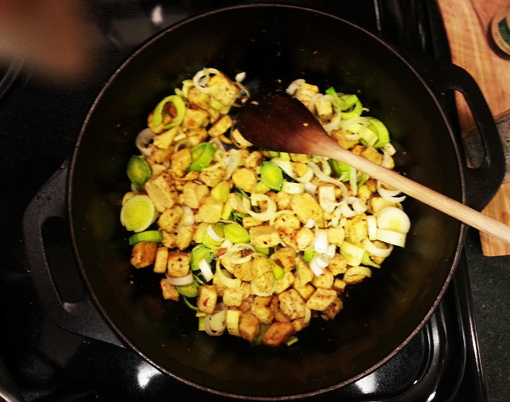 Add the garlic, leek and cardamom, ginger and more curry to taste. Fry for a couple of minutes, adding more oil if needed. 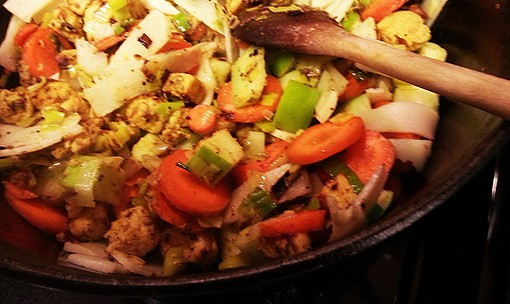 Then add carrots, bamboo shoots, and apple, fry for a bit. Add pineapple and banana just before serving, pepper to taste, and a little bit of cream (I use half & half, mom used cooking cream, which is in between h&h and heavy cream.) Serve with rice. I like muffins. 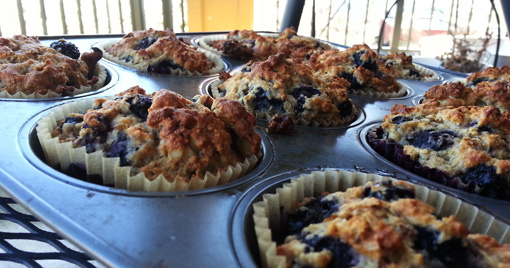 In fact, I like blueberry muffins the best, and a few months ago I found this recipe for “to die for blueberry muffins”. And they really are – perhaps too literally; while very tasty, they’re also so sweet you’d have to limit yourself to one a week if you don’t want a complete sugar overload. What to do? Fix, of course. I’ve adjusted the recipe to reduce sugar, add whole grains and fruit, and be more filling. As a result, the muffins are very little like the original product; they’re less fluffy, moister, but also more filling. Please note: I have reduced the sugar, but not gotten rid of it entirely. I’ve also replaced with sugar with raw sugar, which has a sharper, almost salty tone to it. Vegetarian. Can be made vegan with non-dairy milk and egg replacement. Oven temp: 400F. Makes 12. Line or grease a sheet or large muffin pans. In a large bowl, mix the dry ingredients. Mash the banana completely. In a smaller bowl, mix the wet ingredients (this includes the banana), then quickly mix them into the dry ones. Fold in nuts and berries. Bake at 400F for 20-30 minutes, or until done. I am a Seattleite and a Swede and serial geek and a know-it-all and a reader.